When I started working at Google in early 2007, it was before Android, before iOS. Mobile was still niche. And while many of us had a sense that mobile was going to be big, I’m not sure we really realized just how big it was going to get. Fast forward to today, and there are now 2 billion monthly active Android devices globally. This is an extraordinarily humbling milestone—and it’s the largest reach of any computing platform of its kind. Today at Google I/O, we celebrated that milestone and showcased a number of ways we’re working to make Android even more useful, including a beta release of Android O and a new initiative to help bring Android to the next billion users. Watches: With new partners such as Emporio Armani, Movado and New Balance, Android Wear now enables 24 of the world’s top watch brands. Cars: Android Auto has seen 10x user growth since last year, supported by more than 300 car models. And just this week, Audi and Volvo announced next generation infotainment systems will be powered by Android. TVs: With 1 million new device activations every two months, Android TV has doubled its number of users since last year. 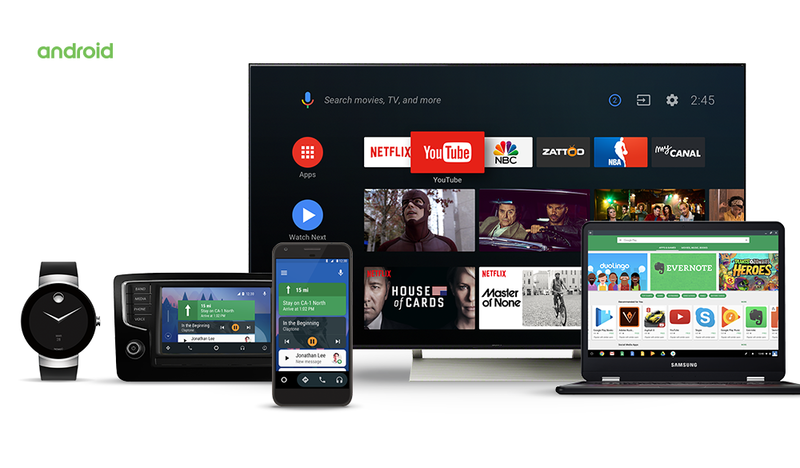 And today we announced Android TV is revamping its home screen with a new channel-based, content-first experience so you can discover new shows and watch your favorites even faster. Internet of Things: Android Things, which will fully launch later this year, already has thousands of developers in more than 60 countries using it to build connected devices with easy access to services such as the Google Assistant. Chromebooks: Chromebooks, which can now run Android apps, comprise nearly 60 percent of K-12 laptops sold in U.S. schools and momentum is spreading. Adoption of Chromebooks in schools has doubled internationally, and we saw 75 percent growth in enterprise as well. Play: Android users installed a staggering 82 billion apps and games in the past year from Google Play. Android O, coming later this year, will bring more fluid experiences to your smaller screen, as well as improvements to what we call “vitals” like battery life and security. With picture-in-picture, you can seamlessly do two tasks simultaneously, like checking your calendar while planning a party on a Duo video call. And Smart Text Selection improves copy and paste—because who enjoys fumbling with text selection handles? By using machine learning to recognize entities on the screen—like a complete address—you can easily select text you want with a double tap, and even bring up an app like Maps to help navigate you there. Under the hood, we’re making your phone startup quicker and your apps faster, and are adding optimizations for developers to help prevent your battery from draining. Because with all of Android O’s new features, you’re going to want a device that can last all day. O will begin rolling out later this year, but developers can try the preview at android.com/beta now. Read more on the Android Developer Blog. We know you want to be confident that your Android devices are safe and secure, which is why we’re doubling down on our commitment to security. Today we introduced Google Play Protect—Google’s comprehensive security services for Android, providing powerful new protections and greater visibility into your device security. Play Protect is built into every device with Google Play, is always updating, and automatically takes action to keep your data and device safe, so you don’t have to lift a finger. Play Protect detects and removes apps that might be harmful. And with more than 50 billion apps scanned every day, our machine learning systems are always on the lookout for new risks. We’re also launching Find My Device as part of Google Play Protect, allowing you to locate, ring, lock and erase your Android devices—phones, tablets, and even watches. Google Play Protect is available out-of-the-box on every Android device with Google Play. We also gave an early preview of a new initiative for entry-level Android devices—internally we call it “Android Go.” The goal is to get computing into the hands of more people by creating a great smartphone experience on all Android devices with 1GB or less of memory. Android Go is designed with features relevant for people who have limited data connectivity and speak multiple languages, and comes to life through three key areas: the Android OS, Google apps, and the Google Play Store. We’re optimizing the latest release of Android, starting with Android O, to run smoothly on entry-level devices. We’re also designing Google apps—like YouTube Go, Chrome and Gboard—to use less memory, storage space and mobile data. And there will be a version of the Play Store that highlights apps specifically designed for the next billion users coming online, while still offering the entire app catalog. All three of these things will ship together, as a single experience, starting in 2018. If you’re a developer, we’ll be diving into these topics and more over the next three days at Google I/O—you can catch the live stream of 150+ sessions at events.google.com/io/. We’re excited to share more updates with you on all of these Android projects over the next few months.